This was the basis of compensation in Vecchio v Comm of Main Roads (1963) The Valuer, January, 1965. For example, from road and rail construction (Edwards v Min of Transport (1964) 2 QB 134). In Edwards a reasonably secluded block of land was exposed to public gaze from the new road works. For example, from noise, vibration, dust, lights, and fumes from passing traffic (Edwards v Min of Transport (1964) 2 QB 134). For example, caused by high tension line easements. For example, steel, high tension transmission towers. The effect has been mitigated in some sensitive areas by the authority painting the towers green. For example, weeds growing around the base of steel towers particularly, on agricultural land. For example, having to plough around a steel high tension line tower or the tower may affect the aerial application of fertilizer and herbicides. This rule provides that compensation for injurious affection is limited to the injury directly and solely attributable to the construction or use of the public work (Edwards v Min of Transport (1964) 2 QB 134). However, it is often difficult to isolate the extent of damage caused by injurious affection emanating from public works particularly, when they are an extension or upgrading of existing works. The effect of increased air traffic and noise from the proposed extension of Mangalore Airport could not be isolated from the total injurious affection emanating from the airport. The High Court held that where injurious affection cannot be isolated, the effect of the works on the acquired land in combination with the original land and constructions is the amount payable Morison's case (Commonwealth v Morison (1972) 46 ALJR 453). Under some town planning schemes compensation for injurious affection can be claimed if the allowable land use is downgraded to an open space or recreational use. 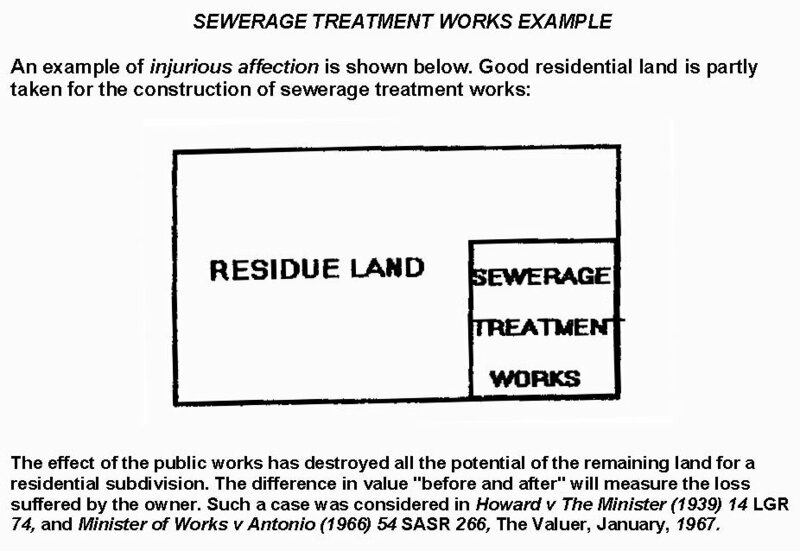 Some town plans also allow compensation for injurious affection caused by other land use downgradings for example, from industrial or commercial, to residential. However, most planning schemes today, do not allow compensation for this latter type of Injurious Affection. Where compensation for such a change of use is not allowed, it raises the question of "regulation or deprivation?" If compensation is not payable, the relevant authorities could effectively "acquire" land with a draconian change of zone and not have to pay compensation otherwise payable. Such an inequitable action cannot occur at Commonwealth level because the Commonwealth must pay just terms for the acquisition of property for Commonwealth purposes (Min of Army v Dalziel (1943) 68 CLR 261) (Dalziel's case ). These arguments apply to the increasing use of transferable property rights as de facto compensation for a damaging zone or an order over property. For example, as "compensation" for owners of heritage listed properties. However, such schemes are clumsy attempts at compensation, and in many cases proper compensation is not obtainable. For example, where there is no market for the transferable right.